You don't have to be Scottish to appreciate this recipe, but it helps. If you are Scottish you already know about Irn Bru. It is the soft drink from Glasgow that cures whatever ails you. Scotsmen pick up a few bottles of it on a Saturday to cure their anticipated Sunday hangover. I am a Sassenach, but I drink it whenever I have an upset stomach; it seems to work as well as any over the counter indigestion medication. But Irn Bru isn't just a miracle cure, it actually tastes rather nice too. A few months ago we published a recipe for jellied gin and tonic. G&T is more likely to be drunk south of Hadrian's Wall so this recipe strikes a balance for the Scots. And just to put a firm stamp on its Scottish heritage the recipe calls for a wee dram to be added. Don't forget the wee dram, it makes a big difference to the flavour. 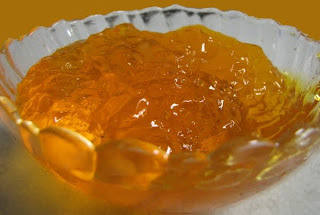 Here is how I made my Jellied Irn Bru. Dissolve the gelatin in a little hot water. You can buy unflavoured gelatin in most supermarkets. The brand I buy contains sachets that each set 2 cups of liquid. This recipe makes a great summer dessert. The Scotch makes all the difference to the flavour by adding richness and, of course, alcohol. In fact, don't serve this to children and definitely don't eat and drive. 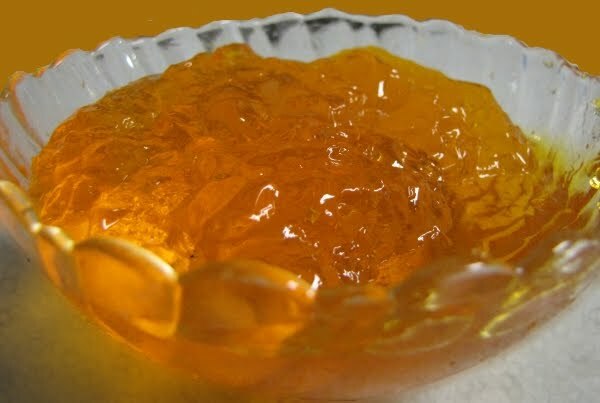 All of the alcohol remains in the jelly. Enjoy.